Ben Brown doesn’t play Vitality Blast cricket but he does everything else for Sussex – leading the side and keeping wicket in the other two formats and even turning out for the seconds when there is time. He hadn’t played first team cricket for a month before this Specsavers County Championship Division two fixture against Derbyshire. But he found the form to revive his side with his highest score of the season, an innings of 116, with his hundred coming from 155 deliveries and including a dozen fours. He is the championship team’s leading batsman, and went into this game with 526 runs. Here he scored his 15th first-class century to lead a recovery after Sussex appeared in some trouble at 111 for four. Brown first put on 103 with Harry Finch and then added 142 for the sixth wicket with David Wiese to place his side in a commanding position. Brown: “I’ve had some time out and was desperate to get out there. I was really pleased to go on and get a hundred because I’ve fallen a bit short earlier in the season. We’ve talked as a group about getting bigger scores, about sticking to our plans for longer, and today we did that really well. These are the kind of score that win matches. It was a worrying day for Derbyshire without any Sussex batsmen getting in the way. Ravi Rampaul, their West Indies Test player, left the field complaining of breathing difficulties and went to hospital to be checked out. And just before play got under way wicketkeeper Harvey Hosein dislocated a finger in a pre-match warm-up. Wayne Madsen filled in behind the stumps until replacement keeper Daryn Smit arrived at the ground a short time before tea. 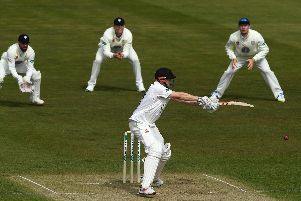 Derbyshire had come to Hove encouraged by their recent record at the ground. Since 1968 they had played Sussex on 12 occasions here, with eight victories, two draws and only two defeats. But they are up against a Sussex side in a rich vein of form. They have won three Vitality Blast matches in a week, to reach this week’s quarter-finals, in which they are away to Durham. And before the Derbyshire match they had won their previous three championship games, two by an innings. At the start of play they were second in the division, seven points behind leaders Warwickshire and six points ahead of Kent in third place. But Derbyshire had the better of the early skirmishes on the opening morning. They had opted to field in overcast conditions and broke through in the sixth over when Phil Salt, playing well away from his body, fell to a juggling catch in the slips. That became 47 for two when Tom Haines was caught low down at third slip by Matt Critchley and five overs later Luke Wells was caught down the legside by Madsen. Just before lunch Michael Burgess edged Tony Palladino to Madsen to put the visitors on top. Brown, however, relishes such situations. And he found a willing ally in Harry Finch, who hit Hardus Viljoen for two sixes in an over on his way to 82. Last season on this ground Viljoen had match figures of 15 for 170 (seven for 80 and eight for 90) in Derbyshire’s victory. Finch was bowled by Palladino at 214 and Brown was finally out – lbw when he might have been forward – at 356. But then Wiese held the fort for Sussex with an unbeaten 89.